It’s been a few days that have felt like an assault course at times. You can feel the pull of the capital from a long way off. A metropolitan area with nearly 30 million inhabitants (10m in the city itself) is hard to ignore. The traffic gets heavier (and slightly more aggressive), the air gets dirtier, and the noises get louder. The lack of decent sign-posting becomes a major issue instead of a minor irritation. And the smells get noticeably stronger (and generally less pleasant). But before all that, there were the hills. The ride to Bandung on Tuesday looked tough on paper. And it was in practice. Two major climbs, topping out at nearly 900m, and an awful lot of little ups and downs in between. It’s hard to get a sense of steepness across on a photo, but you can hopefully see the gradient near the top of the second climb here (the road follows the line with the rock face behind it). 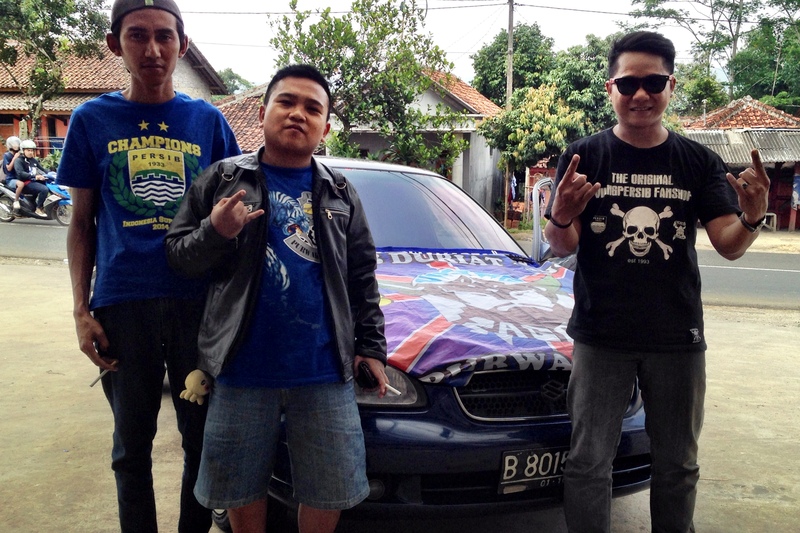 It was a brutal day, and I was pretty well knackered by the time I rolled into Bandung. To the extent that I didn’t really notice the increasing traffic until I got back on the road yesterday (Wednesday) morning. It was mayhem. And this was on the ring-road, rather than the city centre. The traffic lights here are on incredibly long delays, resulting in hundreds of scooters, minibuses (‘Bemos’), vans and cars building up at every red light. When the lights go green, everyone charges across the junction, and then screeches to a halt again as the Bemos pull up in the middle of the road on the other side to disgorge their passengers. Once you’ve squeezed past them, it’s all clear for a few hundred yards to the next set of lights, where the whole process repeats. Jakarta, I can now say with some authority, is worse. As I crossed the last of the hills, it was a steep, twisty and poorly-surfaced interlude between the traffic madness. It was fun. There was a constant stream of trucks, scooters and cars going the other way, draped in blue flags. It turns out that football is just as big in Indonesia as it is at home, and that Bandung had just won the league, with stacks of fans heading into town to celebrate. At least I finally got my own back on the photo-muggers, and got a shot of some of them (all, oddly, Manchester United fans too, and not even from Surrey). So, having got as far as Jakarta, I’ve got some logistics to sort out. 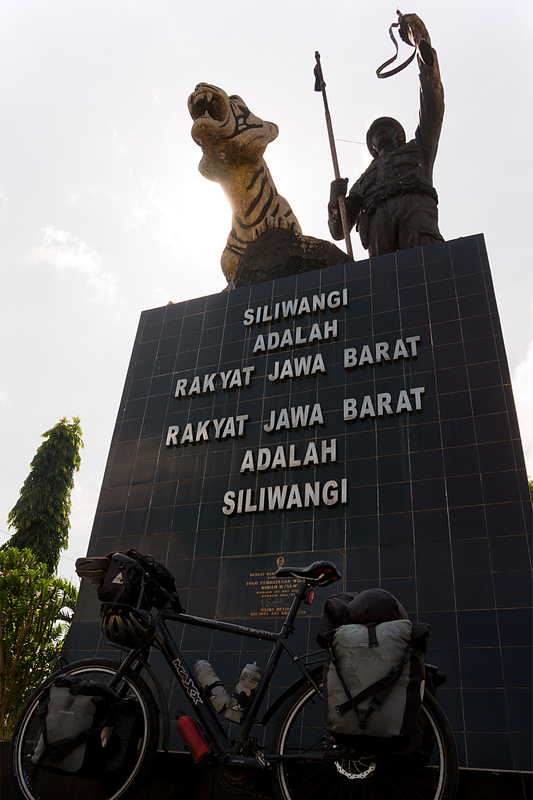 I’ve got six days left on my 30-day visa, which is not really enough to get to a port or airport in Sumatra. With a bit of luck, I’ll be able to get a ferry up close to Singapore from here before my time expires. Trouble is, it’s pretty much impossible to work out when and if the ferries are running without going to the office and asking. If there’s one in time, I’ll get it (hopefully with a couple of days to poke around Jakarta). If not, it’s either a visa renewal or a flight. You might have got the impression from recent posts that I’d fallen for the happy madness of Indonesia’s National Road 3. You’d have been right too. But not any more. It’s let me down badly. Maybe I expected too much, and tried to push too hard (I have been trying to increase the mileage since Yogyakarta). Whatever, by yesterday afternoon (Friday), I was sat at a level crossing watching a train flash smoothly by, and wishing I was on it. 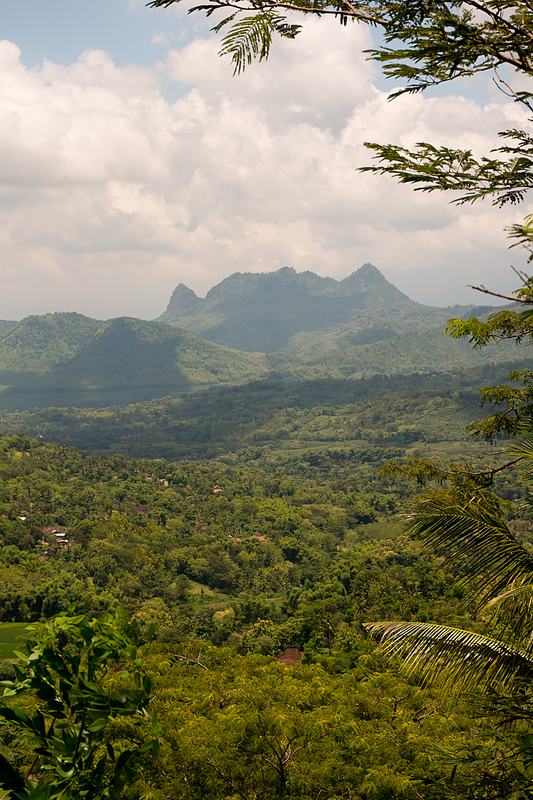 It’s not the scenery, which has remained pleasant and lush and green (if a little hilly as I approach the inevitable volcanic passes I need to clear to get towards the north coast and Jakarta). It’s not the people, who have remained lovely throughout. And It’s not the traffic, which I’m well used to by now. Or even my standard bugbear, the weather. No. It’s the road itself. Ever since Yogyakarta, the surface has deteriorated. There have always been a few rough spots, but it’s got kind of ridiculous for the last hundred and fifty kilometres or so. For long, seemingly endless, sections it might as well be ploughed. Potholes, ruts, tree root damage, odd ripples which look like the road’s melted and then stuck together again in waves. I actually hit some roadworks this morning, where they had stripped the surface off the top of the road. The bare gravel was much smoother than most of what I’d been riding. Down goes the speed, up goes the effort. It’s like mountain biking, having to use your whole body to keep moving while keeping the bike and bags in one piece. Constantly out of the saddle to absorb shocks. Constantly un-weighting the front, then the back on every lump and bump to avoid damaging the wheels. Constantly concentrating to find the smoothest line, and make sure you can take it without getting rear-ended by a bus. It’s hard work, is what I’m trying to say. And I’m getting a wee bit tired of it. There may be a little hope. 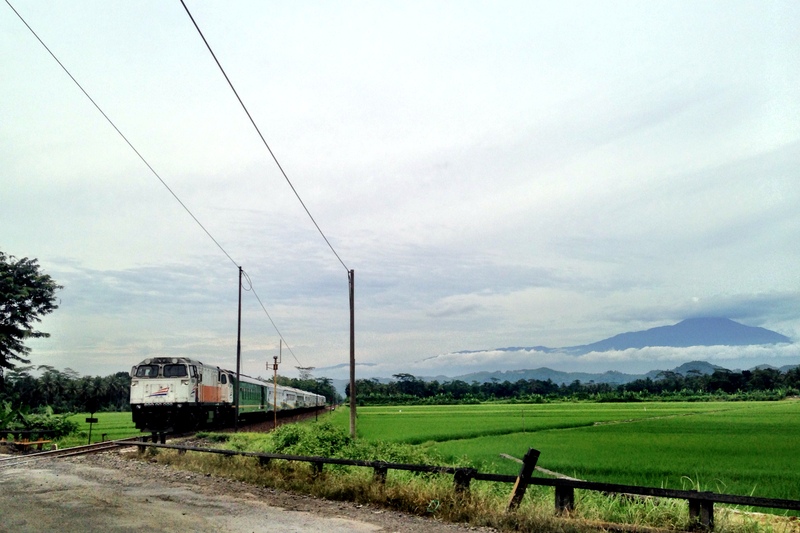 The Beast and I rattled and bumped to the border between central and west Java this afternoon. The road has been a little better since the border, though it’s only been a few miles. I’m not counting my chickens yet. 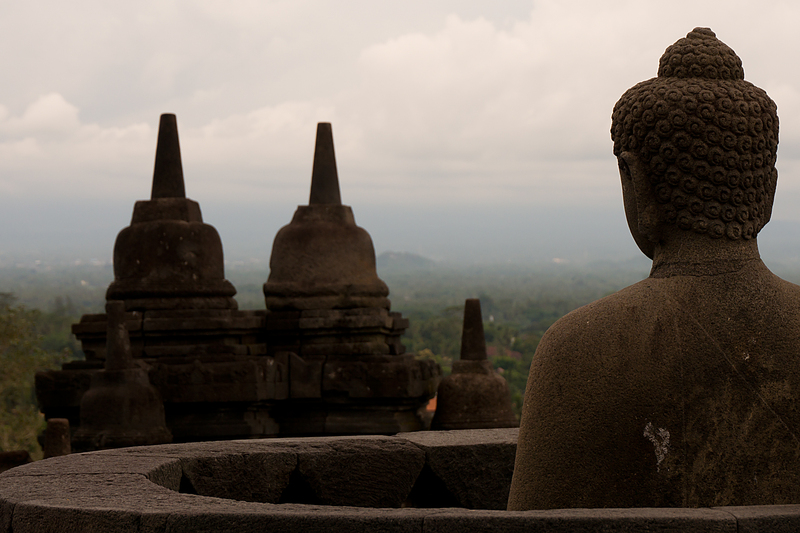 While the road might have changed, one thing has remained constant since I was at Borobudur. Being photo-mugged by the locals. It never happened before Yogyakarta, but it’s been pretty much constant since. Indonesians don’t do the full-on gawking, ‘staring at the weird foreigner’ thing which happens in other places. But they pretty much all have camera phones. And they do all seem to want a photo with the weird foreigner. A couple of local tourists got me at the border. Before that, a bunch of scootering girls caught me at a shop at lunchtime. And then another school football team got me at my final drink-break. It’s nice, but a bit odd to be a tourist attraction when I’m the one on tour. Later on, it was quite easily my scariest evening’s riding since I used to commute in London. A head-torch turns out not to provide a massive amount of illumination in the pitch dark gaps between villages. And combining it with a helmet means that whatever tiny pinprick of light is produced is generally aimed at either the sky or the handlebars. This all makes it very hard to see either the side of the road or the gradient, unless there are other headlights about to steal light from. But if there are other headlights, that means you’re in the grip of the standard Indonesian traffic frenzy (with less visibility than usual). Fun, fun, fun! It wasn’t even (really) my fault that I got stuck out there as darkness fell with forty kilometres still to go to my destination. I knew I had a fairly long run (123km) ahead of me, and set a super-early alarm to give myself time. For some reason, despite being connected to the network, my phone managed to lose an hour in the night, leaving me playing catch-up before I even started. And then a badly-timed burst of rain left me stranded until nearly dusk. And because it was only nearly dusk, I refused the kind (mimed) offer of shelter from an Indonesian family whose roof I’d been sheltering under from the rain. So really, not my fault at all. Apart from the unintentional night riding, it’s all been going quite well. Although I’m running a little slow (halfway through my Indonesian visa time already! ), I’ve been making reasonable progress across Java. And I was greeted on the road into Yogyakarta yesterday (Wednesday) by a mosque dressed up as St Basil’s Cathedral in Moscow. 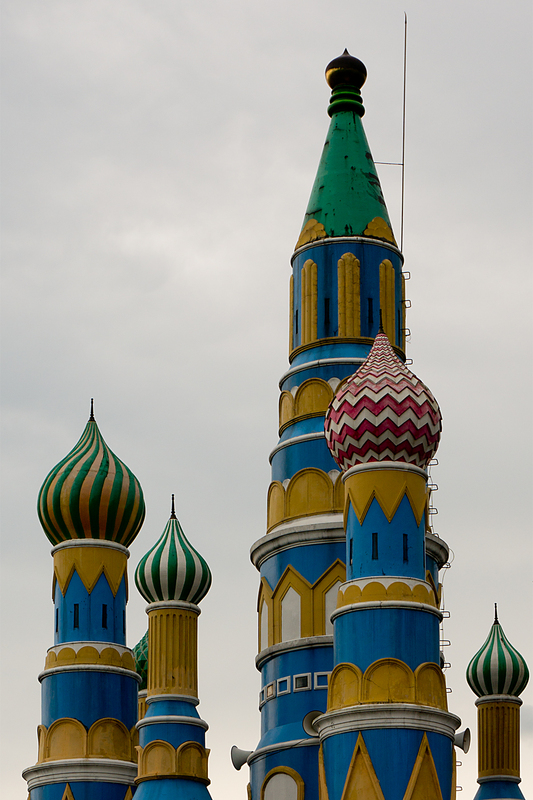 Or maybe St Basil’s was modelled on a mosque; who knows? Yogyakarta is the biggest city I’ve been to here, and is a cultural centre for the country. What I really wanted to see was Borombudor, a huge,ancient Buddhist temple a few miles out of town, which was dug out of the forest in the late 1800s, and is now an Indonesian ‘must see’. I got out there today, with rain threatening (though thankfully, not actually falling on me for a change). It’s a very impressive site; a flat-ish pyramid with tiers of Buddhas and Stupas all the way up, as well as some fairly vertiginous steps and drop-offs (health and safety is not quite such a big deal here as it is at home). And the taxi ride out and back was a nice little adrenaline spike to get me ready to be back on the road tomorrow. It’s actually my second new year of the year tomorrow, as the Year of the Goat (or possibly the Sheep; there are a lot of ambiguous drawings and inflatable toys around) kicks off. Once again, depressingly, without pictures. I’ll get some decent wifi soon, I’m sure. Sorry. National Route 3 is one of only two major east-west roads on the island of Java. You’d think it might be a fine, wide highway, zipping traffic efficiently from one end of the island to the other. But it really, really isn’t. It’s more like experiencing the whole life of Java compressed onto a (very, too, scarily) narrow strip of tarmac, and rushing past in a crazy cavalcade wreathed in diesel fumes and dust. It deserves a little more attention than I gave it in the last post. My first view of Java was of a volcano and clouds. The volcano warned of hills to come, and the clouds (and reports of flooding all over the west of Java) suggested that rain might become an issue once again. Nothing warned me about the impression the roads would make, even after a warm-up in Bali. A gaggle of schoolgirls in pink hijabs shoot by on scooters. Some two-up, some three up. Some texting. Some smile and wave – “Hallo Meester!” – before dividing each side of the truck in front, which is plastering me with diesel fumes. The truck turns out to be stuck behind a scooter with a dumpling shop riding pillion. I have to pass him as well, attentive to the gentle honks of anything behind which is quicker. Just letting you know they’re there. I’m through, and there’s a slight break. Few deep breaths, and dodge a wheel-sized pothole (to the inside; feeling clever until I see an old man on a bike loaded with reeds heading straight toward me). A bit later. A clear spot. I switch off for a second. A truck comes around the bend ahead, followed by a slipstreaming inter-city bus, which immediately moves out to overtake it. My side of the road. Horn blaring, lights flashing. The road’s full, so I’ve no choice. Dive onto the dirt, and watch the wall of metal flash past. Straight back on, in case I lose my nerve. A town, and things slow down. And clog up. More Hallo Meesters, overlaid with the crunching of ancient truck gears, music pumping from somewhere, and the strains of the local muezzin trying to make himself heard over the general hubbub. 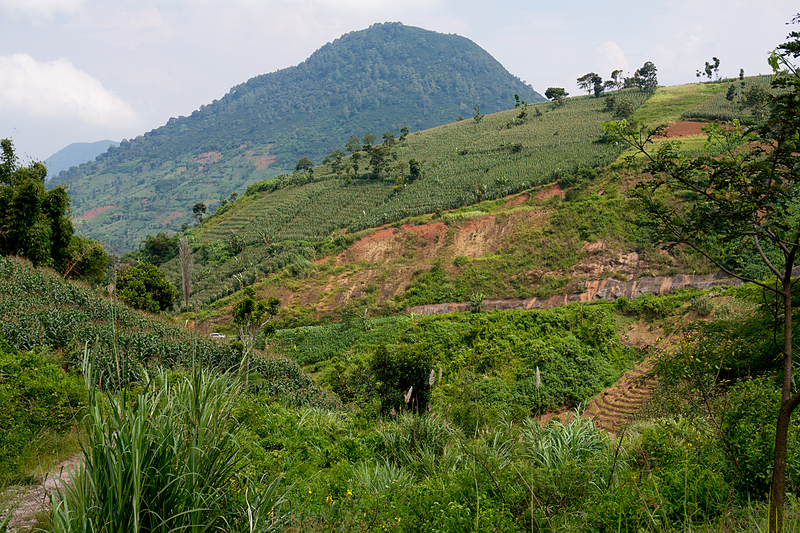 Smells – diesel, satay, sewage, fried chicken, coffee, two-stroke engines, over-ripe fruit. A family come past on a scooter. Mum driving, then the two kids, then Dad on the back. Big smile, a Hallo Meester, thumbs up. All of them. Start climbing. Less traffic. The more overloaded trucks barely make my speed up hills, so I can stop and wait for the convoy stuck behind them to pass before heading on up on fairly clear roads. Almost everyone who passes gives me a friendly honk, or a shout of encouragement, or a thumbs up. Everyone’s so nice on the roads; it’s the only way it could work here. At home, there would be road rage everywhere. None here at all. Maybe getting there on time is less important than getting there alive. Down the other side; passing trucks with hopeless brakes edging down the hill under massive overloads of rocks, soil, wood, metal, whatever. Get to stop, wash, collapse into bed. Next day, the rain comes. At the bottom of a 700-metre pass. Grr. The road goes quiet for a minute as everyone gets their rain-capes on, then the madness resumes. I’m soaked and covered in road-filth in a matter of minutes. Another fleet of kids; boys this time, in football gear, boots dangling from the saddles, precariously close to the wheels. Endless encouragement in broken English from the scooterists and quicker truck drivers as I climb into the low clouds. A break as the rain becomes torrential high on the pass. Under the tin roof of a little restaurant-shack clinging to the mountainside. An old man dipping his bare feet in the river running across the road, a Muslim lady staring folornly at the weather and muttering. I guess she’s praying for it to stop. It doesn’t stop, but it does ease a little. I’m running out of light, so I’m off, over the pass, and down the slippery, rutted and pot-holed descent. In the dusk and the rain. I zip past a couple of trucks and another scooter-borne snack bar. This is why you want disc brakes on a touring bike. Confidence. Hit a rhythm, slaloming down the hill towards a dry room and my bed. Let a car through. Friendly honk. Swerve the lying water; could be holes underneath. Judder on the shoddy surface, take violent evasive action to avoid a family of feral chickens crossing the road. Wonder why they’re crossing. Smile. My reward is my first aggressive honk from a flying bus. Clearly not an animal lover. Splash into town as it gets dark. More Hello Meesters, and what sounds like a “Nearly There, Meester”. I am there, thankfully. Into the room. Wash, food, bed. Same again tomorrow. Loving it. There’s something strange about the money here in Indonesia. It took me a while to work out that everywhere I’ve been so far (including my evening in Mexico, where I used US Dollars) has had a Sterling exchange rate of one-point-something to the pound. The Euro, the Canadian, US, NZ and Australian Dollars. All of them. You kind of get used to it. Of course, the cash is only one small difference now that I’m very definitely out of ‘the West’. This is the world’s most populous Muslim country, and there are many changes from the English-speaking, first-world countries that I’ve left behind. Apart from the changed countryside, there’s now a significant language barrier to overcome, the prices are way down, and south-east Asian scooter madness is a new challenge to the touring cyclist. Oh, and there are sometimes monkeys by the side of the road (much easier to spot than kangaroos!). I was delayed getting on the road in Bali. Not, for a change, because of the weather. I was ready to hit the road on Friday morning, when I discovered that an old friend and work colleague had just arrived in Bali on holiday. He was staying just a couple of miles up the road. Clearly, a swift change of plan was required. And, eventually, a day late (but a happy coincidence, a couple of Bintang beers and a pizza richer), I finally rolled out on Saturday morning. 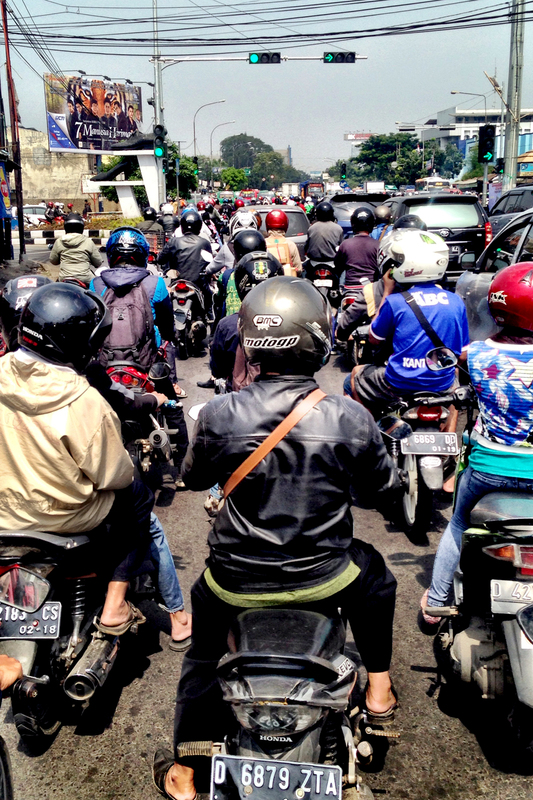 Anyone who’s ever been to Bali will be able to tell you about the nutty traffic in the Denpasar area, especially the tourist areas around Kuta. Indonesians theoretically drive on the correct (left) side of the road. But the roads are very narrow, there are a lot of taxis, buses and vans around to block things up. And swarms of scooters make up their own rules; no one way streets or traffic lights for them! Once you get up the nerve to jump in, though, it’s not so bad to ride inside the maelstrom. Although it’s chaotic, speeds are very low in towns, and it actually feels a bit more dangerous on the open road, with long-distance buses the main threat. Anyway, I’ve been going gently for the last three days, allowing my body to readjust to riding after over a week off, and giving myself time in the shade and to get used to the traffic. And I made it safely off Bali on Sunday, and onto Java by ferry. Once I get used to egg-fried rice and tofu in chilli sauce for breakfast, and figure out how to use a squat toilet (tricky when you can’t squat without toppling over backwards), I think I’m going to like Indonesia. The first big hills rear up tomorrow, and then I need to crank up the kilometres to make the most of my 30-day visa. At my current rate, I’m not going to get all that far. Now, how many millions can a man spend in a month? I’ll keep you posted. And hopefully, get some pictures together for next time. I’m not sure how a post without any cycling involved really fits into an account of a round-the-world bike ride. But there hasn’t been any riding since I got to Cairns. 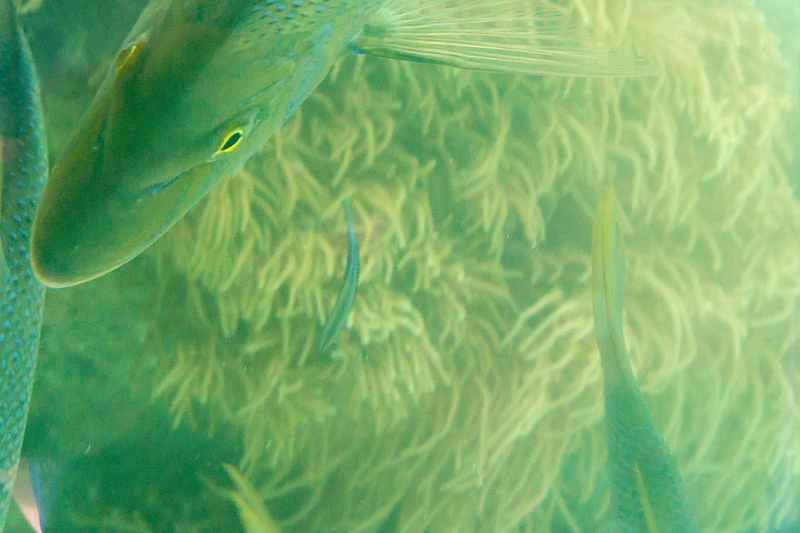 Some coral, some fish, an awful lot of flying and another international border. No riding at all. I spent so many weeks in Queensland riding parallel with the Great Barrier Reef that it would have been a crime not to go and see it. 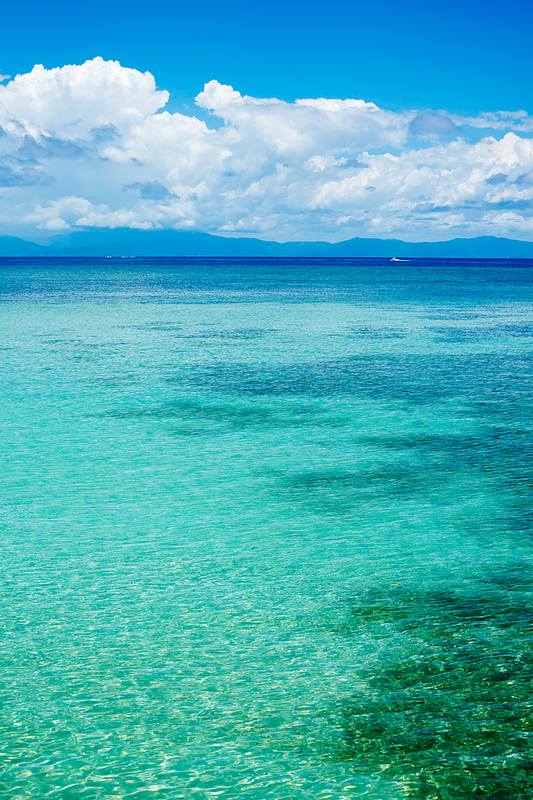 I finally got the chance in Cairns (it’s probably more accurate to say that I had my last chance at Cairns; I’ve always been an expert in putting things off ’til the last minute). And so, on my last whole day on the east coast of Australia (Saturday), I hopped on a ferry and headed for Green Island. Halfway there (it was the morning, and I’m never all that sharp before lunch), I realised that I’d forgotten to either rent an underwater camera or buy a waterproof disposable one. This was yet another ‘doh!’ moment to add to the several I’ve accumulated so far during the trip. As I waited on the jetty for the boat back to town, it became apparent that another (yet another?) 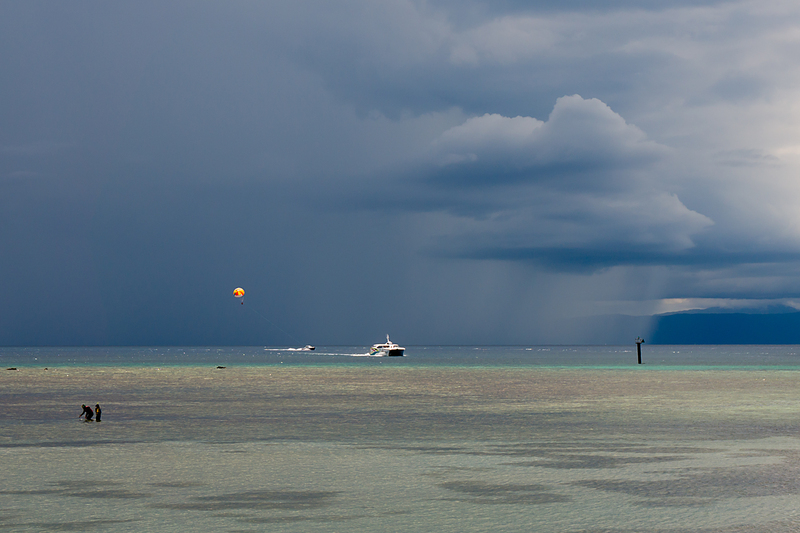 storm was heading straight toward me, entirely obscuring Cairns behind an impenetrable sheet of rain. When I got back that evening, I was accused for the first (but by far not the last) time this week of bringing the rain with me. It hadn’t rained much in Cairns this wet season until my arrival, despite my fairly regular soakings further south in Queensland. I didn’t think too much of this at the time, until I crossed the country to Perth. As I said last time, the ridiculousness of aviation routes and fares meant that flying three sides of a fairly large (think most-of-Europe sized) square was cheaper than heading to Indonesia in a straight line. It also meant that I could visit old friends (Matt, Jennifer and family) in Perth. I went to school with Matt, but we worked out that it was fairly close to decades (plural) since we’d last seen each other. Astonishing how time flies (and how old I must be). And it was also an excuse to stretch my time off the bike by another few days. Though the Beast’s not particularly happy at having been wrapped in cardboard and battered by baggage handlers across three time zones. 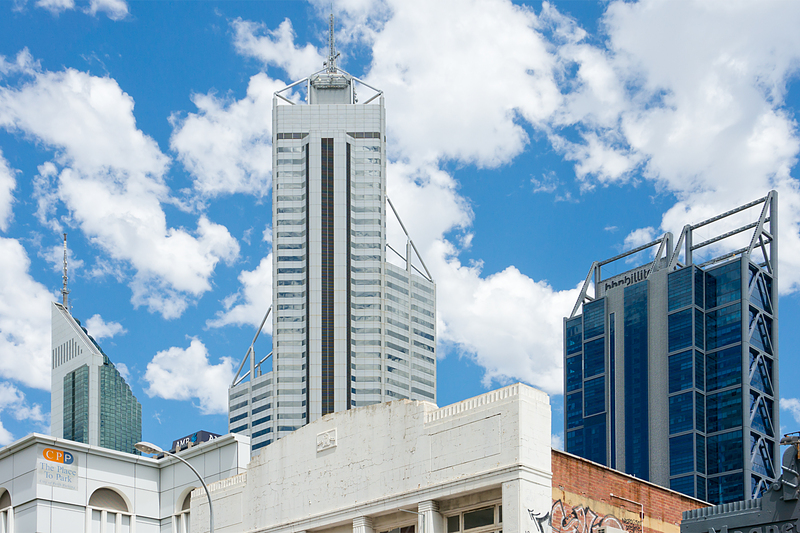 As the picture above might suggest, Perth in the summer is usually hot (but emphatically not humid) and dry. As the picture above might not adequately suggest, within an hour or so of my arrival on Sunday, an immense thunder storm kicked off. The accusation of storms following me around was repeated, and staunchly defended. But it was starting to worry me now. And the worry deepened yesterday (Tuesday), as I raced incoming, menacing dark cloud back to the house. A casual observer might have thought that the rain thrashing in within five minutes of my arrival meant that wherever I go, precipitation follows. I might even be starting to agree. Maybe I am, indeed, destined to be forever stalked by lightning and heavy rain. If it’s going to catch up with me again, though, it’s going to have to leave Australia and get me in Indonesia. As I left Perth today, I was departing under crystal-clear blue skies, and remained in them all the way to Bali. It clouded up later, though. Of course it did. Any bets that the first update from the road in Indonesia won’t include the word ‘storm’? Or ‘rain’? Or at least ‘shower’?